Sorry for the radio silence, but I have been on vacation for the last ten days at home in Boston, at our family beach house in Rockport, MA, and finally a short stint in New York City. I wanted to share with you a place I have been going to since my childhood: the most beautiful and picturesque New England seaside town on Cape Ann: Rockport, Massachusetts. Surrounded by the Atlantic Ocean on three sides and steeped in history, Rockport is primarily a suburban residential and tourist town, but it is still home to a number of lobster fishermen and artists. Go for the hand-made donuts at Brothers Brew Coffee Shop on Main Street. Locals will know this as the original Coffee Shop, and while it has been given a facelift and a new name, the donuts are still as good as ever. For a proper sit-down breakfast, head to Flav's Red Skiff for blueberry pancakes, french toast, waffles, eggs and giant omelettes. Go early to avoid the line. They also serve lunch and dinner and I love getting their steak bomb sandwiches as take-out to eat on the beach or at home. In 1856 a gang of 200 women led by Hannah Jumper swept through the town and destroyed anything containing alcohol in what is called "Rockport's revolt against rum" and banned alcohol from the town. Except for a period in the 1930s, the town remained one of 15 Massachusetts dry towns. Rockport remained dry for many years until recently, when it was voted that alcohol could be served at restaurants, but liquor stores are still illegal. You can walk by Hannah Jumper's house a few doors down from the Red Skiff. After breakfast, take a stroll down historic Bear Skin Neck. You will find ice cream parlors, art galleries, shops of all kinds, and a beautiful vista out onto the Atlantic Ocean at the very end of the neck. You can buy lobsters at the famous Roy Moore Lobster Co. on Bearskin Neck, or if you prefer not to be the one to drop these creatures in scalding water, head to Roy Moore's Fish Shack for a lobster meal looking out to the ocean. One of my favorite stores on Bearskin Neck is Capt. Steve's Sea Shell Shop. You can find every kind of sea shell, starfish and sand dollar in this shop and the staff are extremely educated on all things shell related. This shop was featured in UK Vogue and Sandra Bullock bought loads of shells and sailor's valentines here when she was filming The Proposal in Rockport. My poor parents: on every single trip to Rockport as a child, my brother and I insisted on a mandatory stop to the Country Store on Bearskin Neck to fill a giant white bag with penny candy of all kinds. Though no longer a penny, this is sugar heaven. No trip would be complete without a stop at Tuck's Candy Factory, where you can watch them make the famous salt water taffy and can also buy fudge and chocolate covered everything. 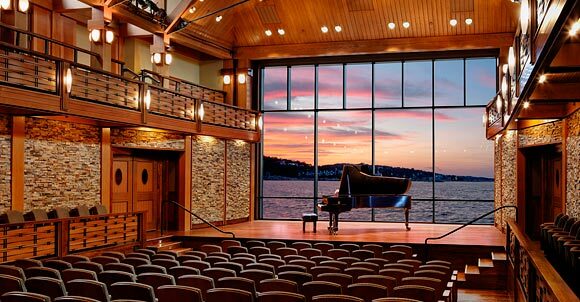 In the evening, go for a sunset cocktail at My Place By The Sea, and then see a performance at the Shalin Liu Performance Center, a new concert hall opened in spring 2010 with state-of-the-art acoustics and breathtaking ocean views. I challenge you to find a more beautiful concert hall than this! Great post, I too adore Rockport and Bear skin is the best. Terrific photos.